Rosin Core Solder 60/40 Tin/Lead 6oz. Ideal for general purpose electronic repair and assembly use. 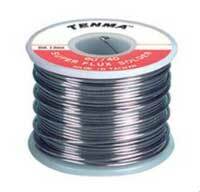 Tin/lead formulation provides the lowest possible melting point. 2" x 2.43" x 2"